Alternative rock/electronic band from Ghent, Belgium formed in 1993. Soulwax deserve some acclaim here! It's criminal that people usually associate them with the Jive Bunny for the modern man that is 2manyDJ's, an enjoyable sonic romp through mashed-up Dolly Parton to George Benson. As novel as the original mix was it's been bootlegged to death and as anyone who's heard Soulwax will agree the real talent of the Dewaele bros lies in their Soulwax work. 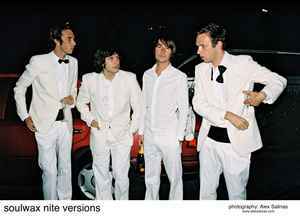 Remixes galore, of their own tracks and others, Nite Versions contains some amazing tracks in the DFA, Tiga style. All their tracks have a very "live" feel to them, the percussion especially drives the tracks along with gusto. I'm very expectant of their next album, encouragingly they don't seem to chuck out any old rubbish but make sure the materials high quality.